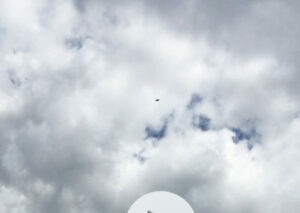 A SPEEDING UFO was seemingly spotted following in the wake of the RAF Vulcan which flew through Sussex. Elaine Costello captured the image on Saturday afternoon, just moments after the decommissioned military jet passed overhead. It shows a small, black object, speeding through the sky, close to the Shoreham Power Station, in Southwick. Elaine said: “The object appears right after the Vulcan bomber has gone out of sight. It flits from the left of the screen to the centre where the video ends. The images have since been shown to one of Sussex’s top UFO and paranormal investigators, who was ‘excited’ by the footage. Malcolm Robinson, is the founder of Strange Phenomena Investigations, and has spoken about UFO phenomena at conventions across the globe. Mr Robinson, who lives in Hastings, East Sussex, said that 95 per cent of all UFO reports turn out to have ‘natural explanations’. He claimed that about four per cent of the reports could be accredited to a combination of ‘black budget’ stealth aircraft and rare, atmospheric phenomenon. Speaking of the image captured by Elaine, he said: “It certainly has the classic flying saucer shape although that in itself does not mean that it lends any credibility. He questioned whether the image could have captured a unmanned aerial vehicle or drone. He added that the claim there were other witnesses to the incident was ‘equally interesting’. “This for me, is one of the few times that a photograph have excited me and I would love to enquire more from the photographer,” he said. Mr Robinson has appeared in numerous newspaper and radio interviews.